Background: Hepatitis B virus is known to be endemic in Africa. The seroepidemiological studies of HBV have shown that infection commonly occurs in childhood in Africa resulting in an increased tendency to chronicity. This cross-sectional study was undertaken to determine the seroprevalence of hepatitis B surface antigen among pediatric patients with homozygous hemoglobin S. Materials and Methods: Three hundred sickle cell anemia children aged 6 months-15 years (both in steady state and in crises) attending the SCA clinic and on admission in emergency pediatrics unit and pediatrics medical ward, Usmanu Danfodiyo University Teaching Hospital, Sokoto, Nigeria, were screened for hepatitis B infection using HBsAg as marker of infection. The sensitive enzyme linked immunosorbent assay method was used for detection of the marker. Three hundred children with minor illness attending pediatrics outpatient department and on admission in EPU/PMW for various treatment in the same hospital served as gender- and age-marched controls cohorts. Results: The sero-prevalence of HBsAg seropositivity for hepatitis B virus infection among SCA children was 17.3% (52/300) compared to 10.7% (32/300) of the control (P = 0.0875). The peak prevalence age group for HBV infection among SCA children was in the age group 1.1-5.0 years (6%) compared to 10.1-15.0 years (4.7%) in the control. Risk factors for HBV infection such as blood transfusion, traditional scarification/circumcision/uvulectomy, and tattooing did not significantly affect the prevalence of HBV infection in both SCA children and controls. Conclusion: Hepatitis B infection is common in Sokoto. The need for strict adherence to HBV immunization and further community-based studies on the risk factors are recommended. Hepatitis B surface antigen (HBsAg) is one of the most useful markers of active hepatitis infection. It appears in the blood exclusively as a component of the virion and as incomplete viral forms. This study determine the prevalence of HBsAg in children with SCA in Usmanu Danfodiyo University Teaching Hospital, (UDUTH), a tertiary hospital in Sokoto, Nigeria. Three hundred children with SCA confirmed by hemoglobin electrophoresis using cellulate acetate media, aged 6 months-15 years both in steady state and in crisis who were attending sickle cell clinic or on admission in EPU/PMW of UDUTH, Sokoto, had their blood samples collected after obtaining informed written consent. The controls were children aged 6 months-5 years with hemoglobin AA, who were attending the paediatric outpatient clinic with minor illness or on admission in EPU/PMW. The study spans from July 2010-January 2011. Approval for the study was obtained from the Ethical Committee of UDUTH Sokoto. Children who have had previous hepatitis B immunization were excluded from the study. Clinical data collected were age, gender of the subjects, risks factors of hepatitis B virus infection including history of blood transfusion and traditional scarification/circumcision/tattooing. Other clinical parameters included were jaundice, palor, hepatomegaly/splenomegaly, and evidence of traditional scarification marks/tattooing/circumcision. The blood samples were centrifuged within 2 hours of collection, and the serum obtained was used to assay for HBsAg by ELISA method using Clinotech diagnostic and Pharmaceuticals Inc, Canada 2010 kits. Statistical analysis was done using SPSS statistical version 17.0. Chi square test was used to compare categorical variables while student t-test was used in comparing mean of continuous variables. A P < 0.05 was considered statistically significant. There were 200 (66.7%) males and 100 (33.3%) females. The mean (±SD) age for SCA children was 6.8 ± 4.1 years. Of the 300 control subjects, 196 (65.3%) were males and 104 (34.7%) females, aged 6.6 ± 4.3 years. There was no statistical significant difference between the mean ages of SCA children and that of the controls [Table 1]. Fifty two (52) SCA children comprising, 40 males 12 females were seropositive for HBsAg giving a prevalence of 17.3%. While 32 controls; comprising 14 males and 18 females were seropositive for HBsAg giving a prevalence of 10.7%. There was also no significant difference in the prevalence of HBsAg between SCA children and the control group (P = 0.9). The highest prevalence of HBsAg seropositivity among SCA children (6%) was seen in the age group of 1.1-5.0 years, whereas the highest prevalence of 4.7% in the control was recorded in age group of 10.1-15.0. 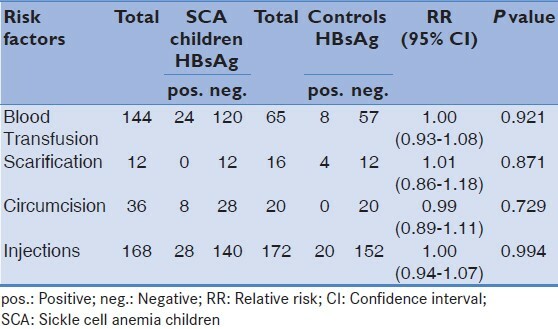 It was observed in this series, for the control, there was increasing number of HBsAg seropositivty with increase in age, but no clear-cut pattern was seen among SCA children. The prevalence rates of HBsAg among SCA children increases with age in the first 5 years and decreases with age in age group 5.1-10.0, and rises again above 10 years. The difference between the SCA children and control was not statistically significant, (P = 0.171) [Figure 1]. [Table 2] shows the various risk factors of hepatitis B in SCA children and controls. There was no significant association between the various risk factors studied and HBsAg for HBV infection among SCA children and controls. This study has demonstrate a relatively high prevalence of HBsAg in SCA children (17.3%). The high prevalence recorded in this study is a reflection of the hyper-endemicity of hepatitis in Nigeria and the fact that initial infection with HBV occurs predominantly in childhood as reported in previous studies. ,, The prevalence of HBV infection using different methods and markers from various region of Nigeria differs. Thus, in Lagos, Lesi et al.,  reported a prevalence of 5.1% and in Enugu, Kaine and Okafor,  reported prevalence of 6.5% among SCA patients. A lower prevalence of 3.6% among SCA children was recorded in Port Harcourt study by George et al.,  but in Jos, Angyo et al. obtained a higher prevalence of 22.85% among SCA children and 19.57% in controls. Another study in Benin, by Abiodun et al., 8 showed a much higher prevalence of 39.2% in SCA children and 19.3% in controls. The higher figures obtained in these series may be partly explained by the highly much more sensitive (ELISA) method that was employed. The differences in the prevalence rates in this series compared to prevalence rates reported in studies done in other parts or regions of the country could also be a result of the wide regional variation in the risk behaviors associated with hepatitis B infection as well as vaccination programmes. We observed no significant differences between males and females among SCA children with HBsAg seropositivitywhich is consistent with the findings in some previous study in Nigeria. However, Lesi et al. in Lagos reported higher prevalence among males In contrast to this, a higher prevalence was seen in females in the controls in this series, which agreed with the finding of Siresena et al. The exact reason for this is not known but may be due to a risky behavior common among females such as ear or nose piercing, indiscriminate use of eye lashes, or other direct contact with mucous membranes of eyes, mouth, or skin for cosmetic reasons. The peak prevalence for HBsAg was recorded among SCA children (6%) in the age group of 1.1-5.0 years, while that for controls (4.7%) was in the age group of 10.1-15.0 years in this study. The explanation for this is not exactly known but the role of early exposure to blood transfusion is a possibility as in the case of SCA children. The 4.7% prevalence recorded for the age group 10.1-15 years in the control may be due to persistent HBsAg antigenemia in present and or past infection. A similar finding to this study was the report by Angyo et al. 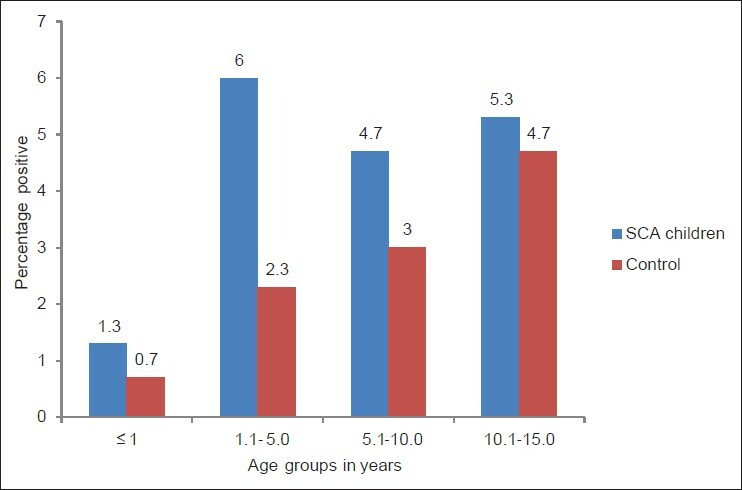 in Jos, in which peak prevalence in the age group 3-5 years was recorded among SCA children. Contrary to these findings in this study, Abiodun et al. in Benin reported peak prevalence in the first year of life among SCA children and that seen in Fakunle et al. study in Kaduna that reported peak prevalence in Nigerian children in the age group of 5-8 years. There was no significant association between the various risk factors studied and HBsAg for HBV infection among SCA children and controls in this series. This supports the study by Angyo et al. in Jos, in which no significant association between risk factors and HBV infection was found. However, Jombo et al.,  found an association between HBV infection and tonsillectomy, tattooing, and use of sharp objects in rural setting in Jos. The lack of significant relationship between various risk factors and HBsAg antigenemia in this study may reflect the practice and the level of awareness of these various risks factors and HBV infection on the side of the parents and the children, especially the older ones. The prevalence of HBV infection in SCA children is relatively high and the underscores the need to strengthen HBV vaccination as a preventive measure among SCA children. 1. Chaves SS. Hepatitis B. Centre for Disease Control and Prevention traveller's health 2010 yellow book. Available from: cdcinfo@cdc.gov. [Last accessed on 2009 Oct 06]. 2. Yakubu AM. Hepatitis viruses and hepatocellular carcinoma in childhood: Facts, myths and prospects for control of future hepatocellular carcinoma in Adults. 2006 Faculty day lecture. Faculty of Paediatrics, National Postgraduate Medical College of Nigeria. 13 th September 2006. 3. WHO Technical Advisory Group on Viral Hepatitis. Progress in the control of viral hepatitis: Memorandum from a WHO meeting. Bull World Health Organ 1988:664:443-55. 4. Centre for Disease Control and Prevention (CDC), Division of viral hepatitis, National Centre for Infectiuos Disease, Viral Hepatitis B. July 2003.Available from: @htt:/www.cdc.gov/ncidod/diseases/hepatiis/b/fact.htm. [Last accessed on 2011 Nov 2]. 5. Agbede OO, Iseniyi JO, Kolawale MO, Ojuawo A. Risk factors and seroprevalence of Hepatitis B surface antigenaemia in mothers and their pre-school children in Ilorin. Nigeria. Therapy 2007; 4:67-72. 6. Fasola FA, Odaibo GN, Aken'Ova YA, Olaleye OD. Hepatitis B and C viral markers in patients with sickle cell disease in Ibadan, Nigeria. Afri J MedSci 2003;32:293-5. 7. Fakunle YM, Abdurrahman MB, Whittle HC. Hepatitis-B virus infection in children and adults in northern Nigeria: A preliminary survey. Trans R Soc Trop Med Hyg 1981; 75:626-9. 9. Angyo IA, Okuonghae HO, Yakubu AM. Hepatitis B surface antigenaemia in children with sickle cell anaemia in Jos University Teaching Hospital. Nigeria. Med Pract 1988;36:15-7. 10. Lesi FE, Fabiyi A, Williams AO. A study of hepatitis associated antigen (HAA) in sickle cell disease patients in Lagos, Nigeria. Nig Med J 1975; 5:310-12. 11. Kaine WN, Okafor GO. Hepatitis B surface antigen in Nigerian children with sickle cell anaemia. J Trop Paediatr 1983;29:55-7. 12. George IO, Yaguo Ide LE. Heptitis B virus infection in Nigerian children with sickle cell anaemia. J Med Med Sci 2011; 2:1213-15. 13. Sirisena ND, Njoku MO, Idoko JA, Isamade E, Barau C, Jelpe D, et al. Carriage rate of Hepatitis- B surface antigen (HBsAg) in an urban community in Jos, Plateau State, Nigeria, Niger Postgrad Med J 2002;9:7-10. 14. Jombo GT, Egah DZ, Banwat EB. Hepatitis B virus infection in a rural settlement of northern Nigeria. Niger J Med 2005;14:425-8.